Actuator for climate systems based on water pipes which allows the control of up to 4 outputs for on/off valves operated at 230VAC by means of triac with protection against short-circuit. It includes independent thermostat for each output, furthermore a module with 10 logical functions. 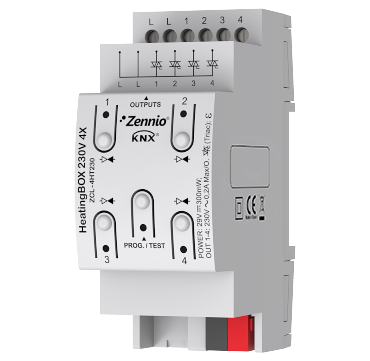 It allows manual control of the outputs with status indication through LEDs.